Windows of the Chicago Board of Trade Building on the morning of Wednesday, October 5. 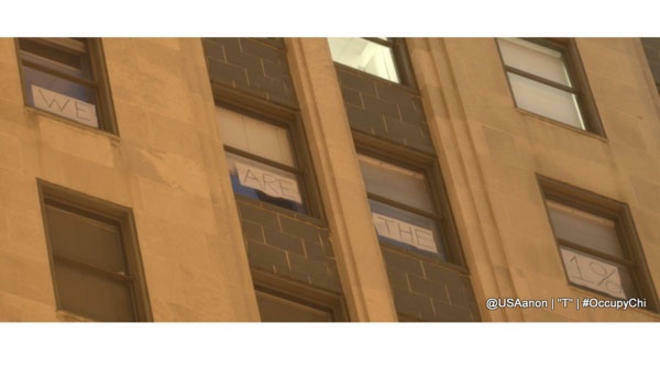 Photograph: @USAanon/"T"
The sign made only a brief appearance this morning on windows of the Chicago Board of Trade Building, but the message lingers. Four pieces of white paper, pasted on as many windows of the historic 141 West Jackson Boulevard building, declared in dark marker, WE ARE THE 1%. The taunt, it seems, was directed at Occupy Chicago protesters who’ve been demonstrating under the banner of "We are the 99 percent," in solidarity with New York’s Occupy Wall Street movement. Fluctuating numbers of protesters have been sitting in for nearly two weeks in front of the Federal Reserve Bank at 231 South LaSalle Street, in the shadow of the CBOT. "This is a full-on endorsement—an exact copy, in fact—of Occupy Wall Street’s assertion that current society consists of a greedy and callous 1% that wields a staggering amount of influence, counter to the interests of the 99%," an Occupy Chicago press release sent this afternoon read. "Likewise, its placement is an act of shocking arrogance showing the world that the highest class is listening to the voice of the people and mocking it wholesale." So, who’s to blame for the sign and its brazen message of preeminence? Thus far, exactly zero percent of the self-proclaimed one percent has been ballsy enough to fess up. And CME Group Inc., the parent company of the Chicago Mercantile Exchange and Chicago Board of Trade, is protecting the party responsible by keeping mum. When I called CME Group to inquire, spokesperson Laurie Bischel was obviously expecting questions on the subject. “Let me pull out my notes,” she said. “What I can tell you is that signage was placed on the building by a tenant of 141 West Jackson, not by CME Group, and the signage has been removed.” Bischel would not name the tenant or identify the building floor. Previous reports have claimed the sign was hung on windows of the building’s 8th floor. However, a previously published newsletter by CBOT restoration contractor Design Installation Systems says the building’s clock base is on the 10th floor, suggesting the windows that displayed the sheets of paper are perhaps a couple floors above ten. Down on the sidewalk at the corner of Jackson and LaSalle, many of the Occupy Chicago protesters were taking the sign's message as a big middle finger—but not neccesarily a surprise.